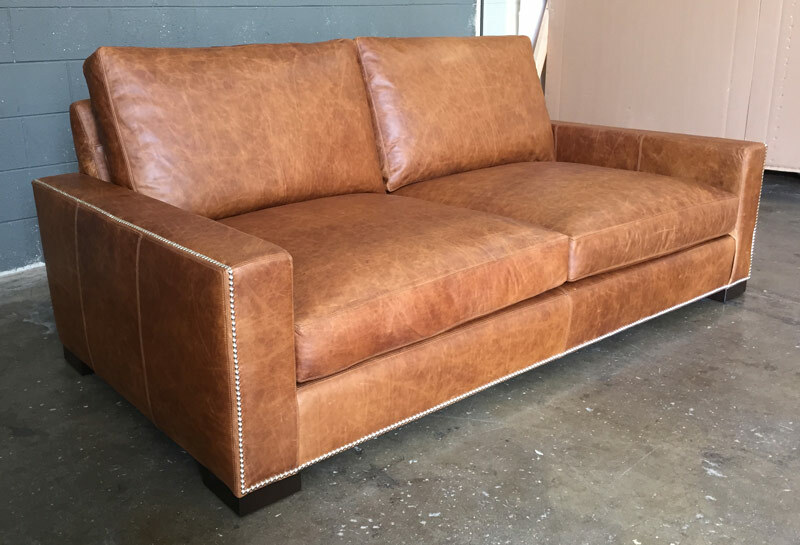 This entry was posted in LeatherGroups.com Reviews & Testimonials and tagged custom, custom length, full aniline, full grain leather, Italian Brompton Cocoa, Italian Brompton Leather, lancaster leather collection, lancaster leather sofa, langston collection, langston leather sofa on February 1, 2017 by LeatherGroups. 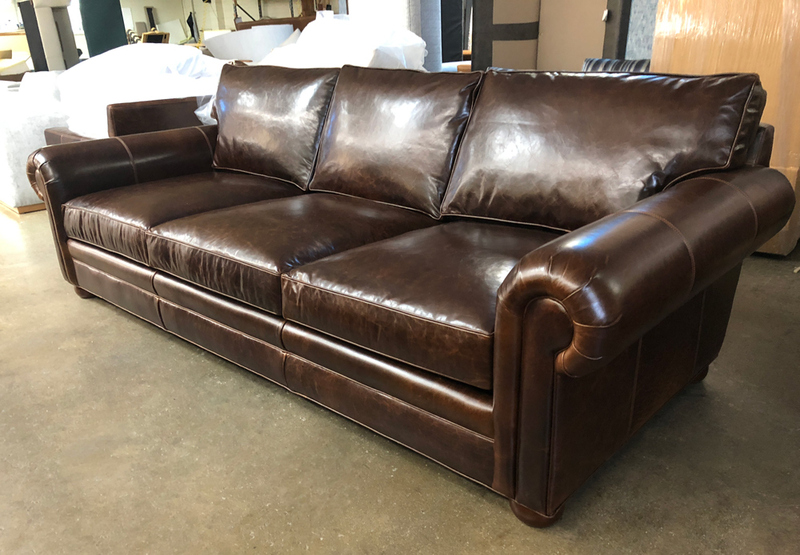 Buying custom leather furniture doesn’t just mean picking a leather and leg color, custom means ordering something built to your specifications. 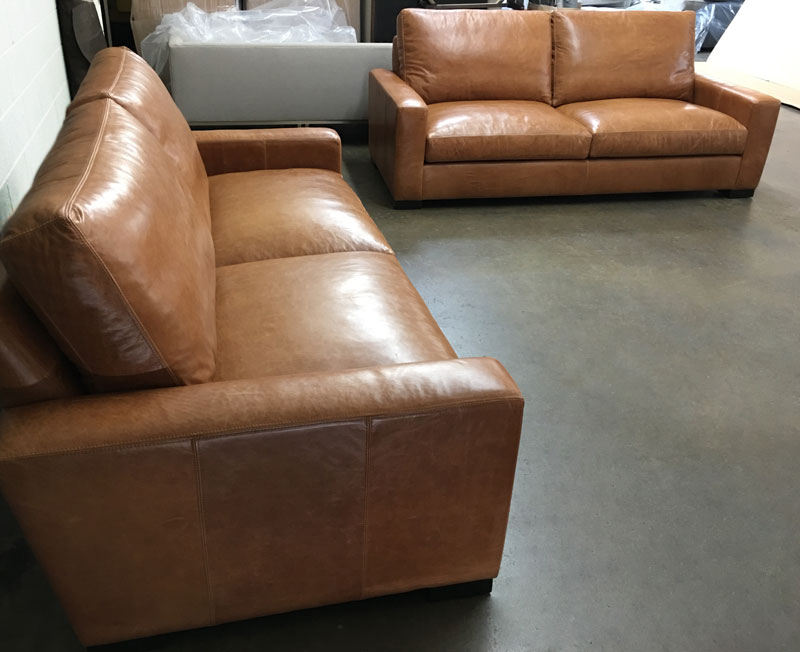 This customer in Canada took advantage of of one of our strengths when asking us to build a set of 84″ Braxton Leather Sofas in a 40″ depth. 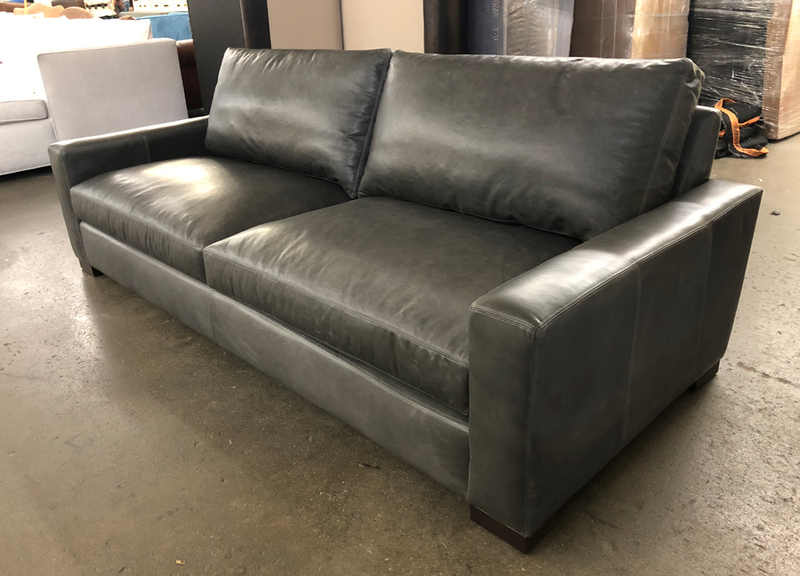 We offer this style configurable on the site in both 43″ and 46″ depths, but also offer custom depth with our leather furniture. 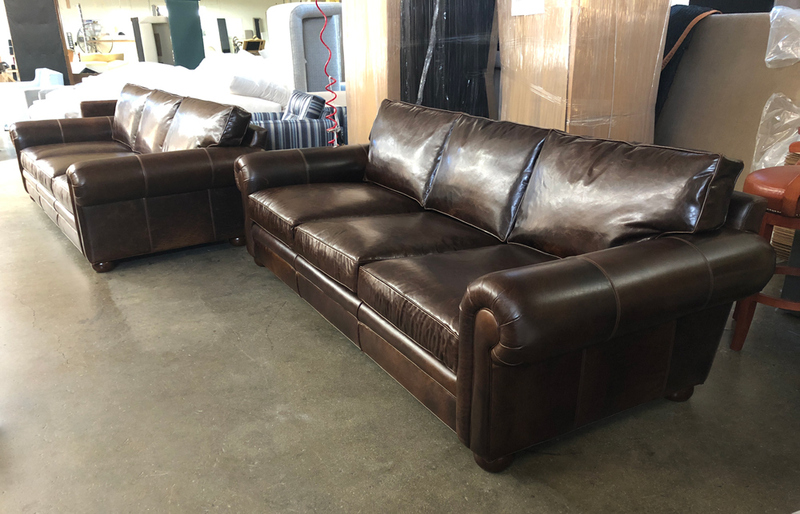 After originally ordering and “Leather To Be Determined” (in order to get her order moving while samples were sent) this client landed on our Italian Glove Chestnut Full Grain Leather. This leather is Full Aniline dyed, and is the same classification or leather as our Italian Brompton leather (from the same tannery). As with Brompton, natural markings and color variation will be present, and this is a waxed pull-up leather that will distress and develop an amazing patina with use. It really just doesn’t get much better than this! 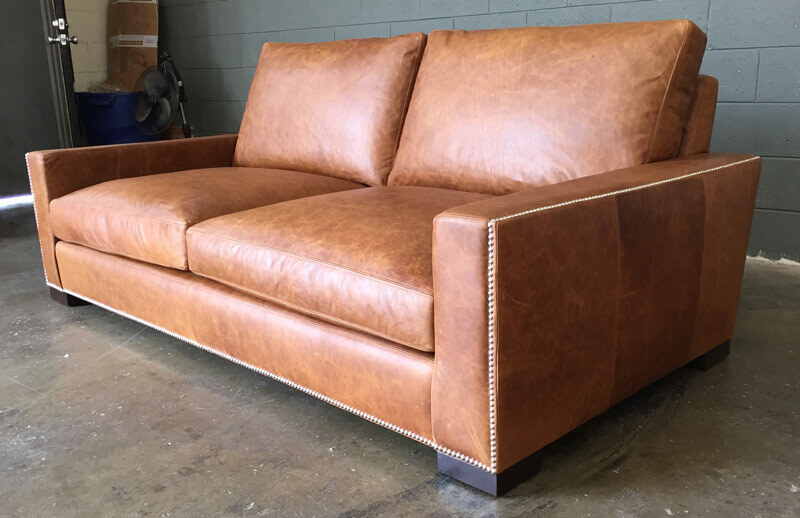 This entry was posted in Braxton, Custom Leather Order Feed and tagged braxton collection, braxton leather sofa, custom, custom depth, full aniline, full grain leather, Glove Chestnut, Italian Brompton Leather, maxwell leather collection, maxwell leather sofa, No Ears on January 15, 2017 by LeatherGroups. 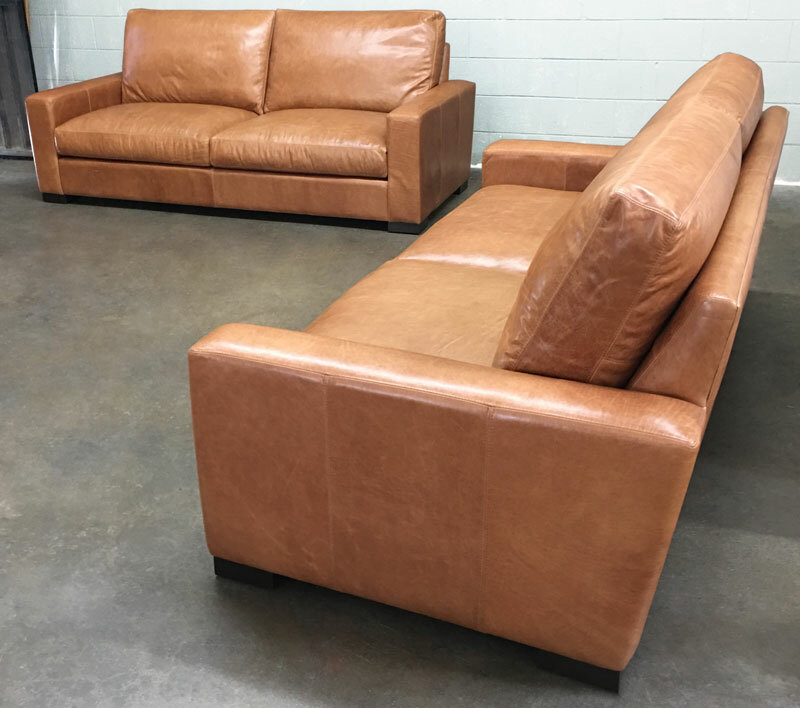 We know a family in Carson City, Nevada that is going to fall in love these two Custom Langston Leather Sofas. This client selected our true 8-way hand tied suspension, and our Italian Brompton Cocoa leather for the cover. We know these pieces will serve them well for a long time to come! 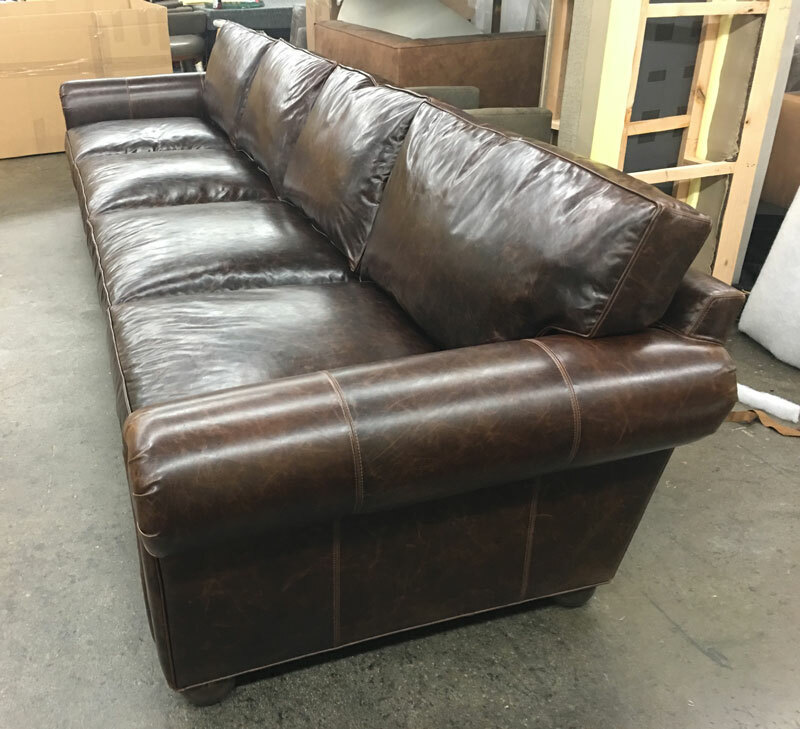 This entry was posted in Custom Leather Order Feed, Langston and tagged 46" Deep, Brompton Cocoa, custom, custom depth, custom length, deep, Italian Brompton, Italian Brompton Cocoa, lancaster leather collection, lancaster leather sofa, Langston, langston collection, langston leather sofa on December 24, 2016 by LeatherGroups. 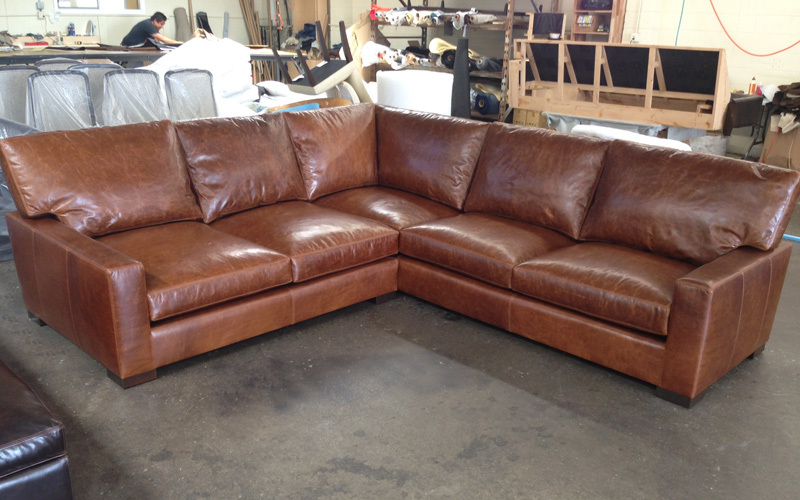 This Braxton Leather Sofa made its way safely to San Mateo California where the new owner is surely breaking it in! 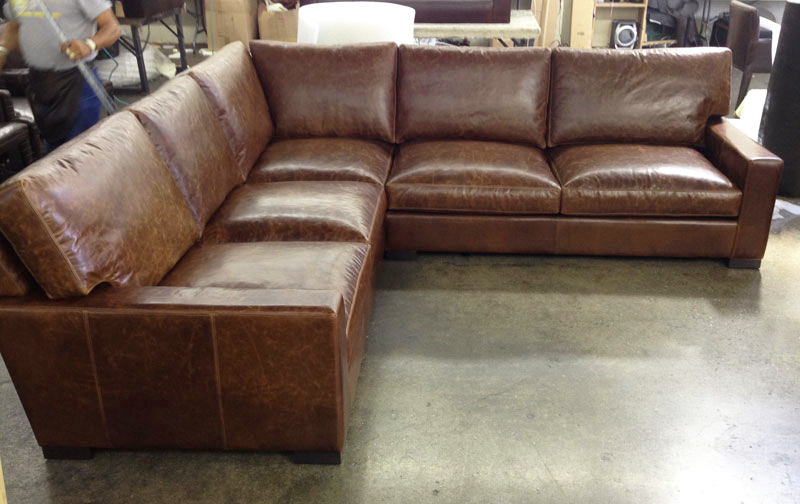 This customer started with our 84″ Braxton, in the 46″ depth and selected our Italian Berkshire Chestnut leather. To add another element of style, they opted for us to apply nail head trim in antique brass finish. After selecting their own specific placement for the trim, our craftsman hand applied each nail as a part of the last step of the production process. Italian Berkshire is an interesting leather that begins it’s life essentially as Brompton, but the tannery then tumbles the hides in drums to distress and open up the hand of the leather, creating a thick, soft feel without the shine of Brompton. 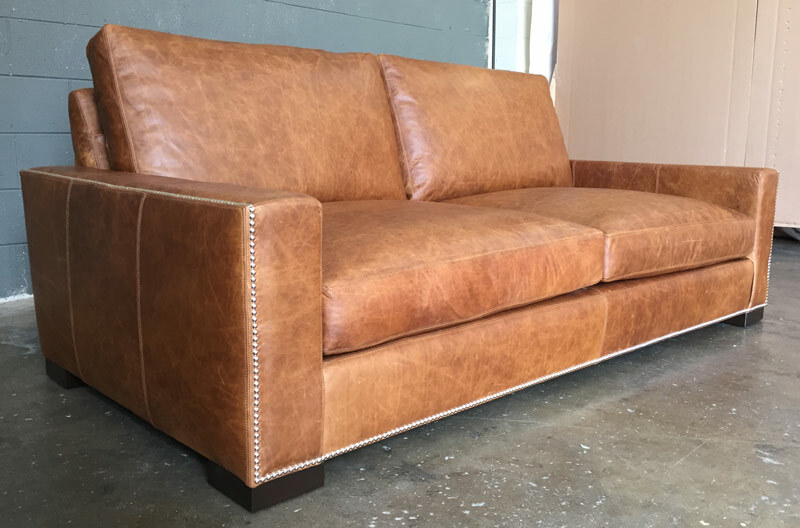 This entry was posted in Braxton, Custom Leather Order Feed and tagged 46" Deep, Bench Cushion, Berkshire Chestnut, braxton collection, braxton leather sofa, custom, Italian Berkshire Chestnut, Italian Berkshire Leather, maxwell leather collection, maxwell leather sofa, Nail Head Trim on December 9, 2015 by LeatherGroups. 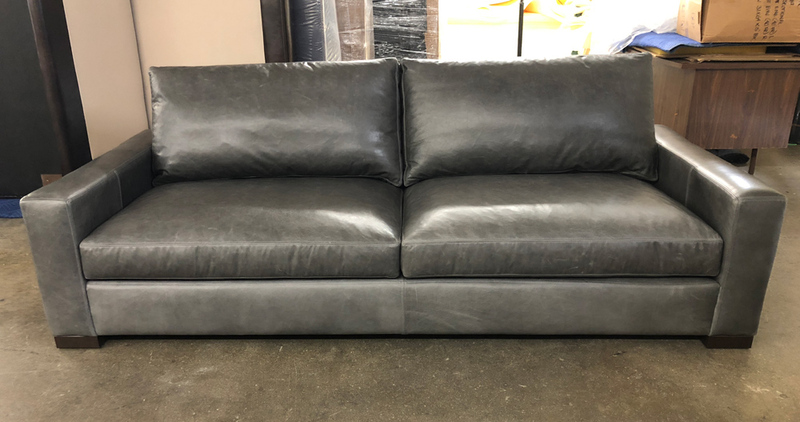 This customized Braxton Corner Sectional just finished production and with 12″ in length added to the Left Arm Facing side (117″L x 105″L x 43″D) this sectional is sure to be a crowd pleaser. 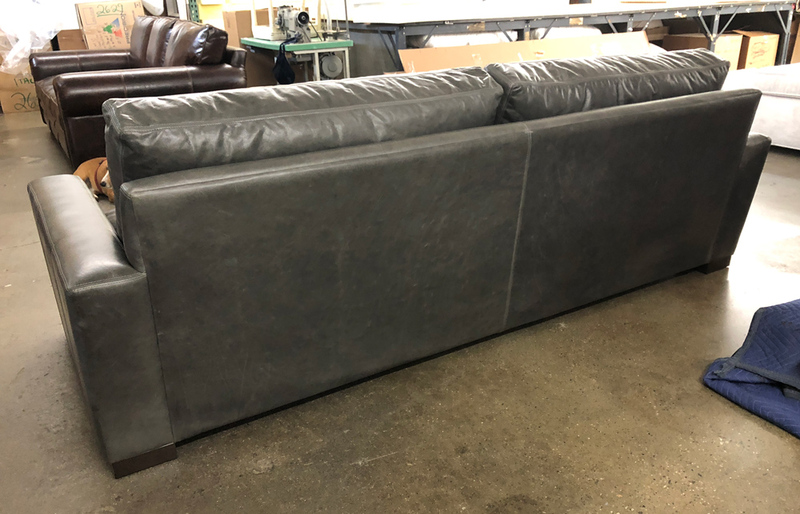 This sectional was upholstered in Brompton Classic Vintage and this customer opted for the back cushions “with ears” which gives this model a slightly more traditional look. 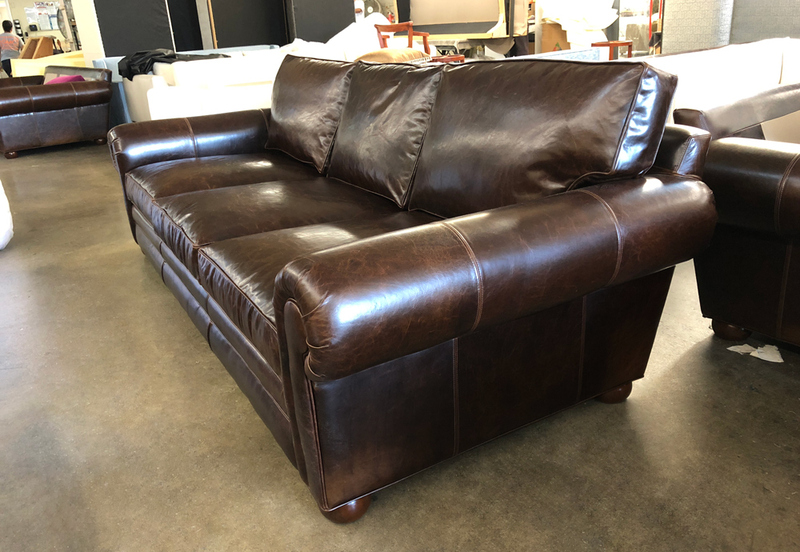 This entry was posted in Braxton, Custom Leather Order Feed and tagged 43" Deep, braxton collection, braxton corner sectional, braxton sectional, Brompton Classic Vintage, Brompton Vintage, custom, custom length, maxwell leather collection on June 8, 2015 by LeatherGroups. *This required some adjustment to the length of the left piece, but our team delivered! This entry was posted in Braxton, Custom Leather Order Feed and tagged 38" Deep, 46" Deep, braxton collection, braxton corner sectional, braxton sectional, Brompton, Brompton Classic Vintage, Brompton Vintage, custom, custom depth, custom length, mixed depths on September 15, 2014 by LeatherGroups.